Spitfire Audio’s Hans Zimmer Strings – what is it? Spitfire’s Hans Zimmer Strings is absolutely massive in all senses of the word. It rolls in at 183Gb (200Gb required during installation) – yes, you read that correctly – and if that runs the risk of maxing out your hard drive, it’s also available on a hard drive for an extra £59 which will also serve as a backup. Otherwise, an internet cable connection or lots of patience is helpful. 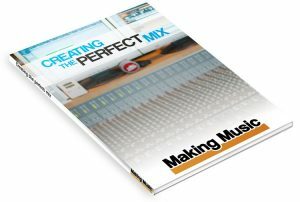 There are 234 presets and up to – wait for it – 26 Mic positions. The samples were recorded at AIR studios, London, which is where many of Spitfire’s libraries were recorded so the samples will blend well with other Spitfire libraries. 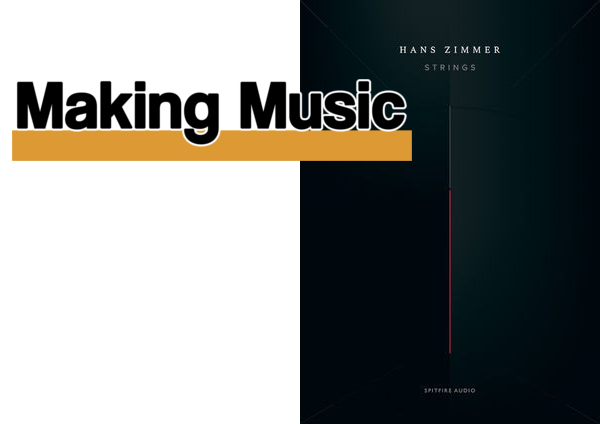 In a departure from Spitfire’s usual library format which uses Native Instrument’s Kontakt sample player, Hans Zimmer Strings comes as a plugin supporting VST2, VST3, AAX and AU formats. If your DAW supports plugins, it will work. The top half of the interface houses the three main controls – Volume (the equivalent of Expression in Spitfire’s Kontakt libraries), Dynamics (which defaults to control by the Mod Wheel) and Knob. 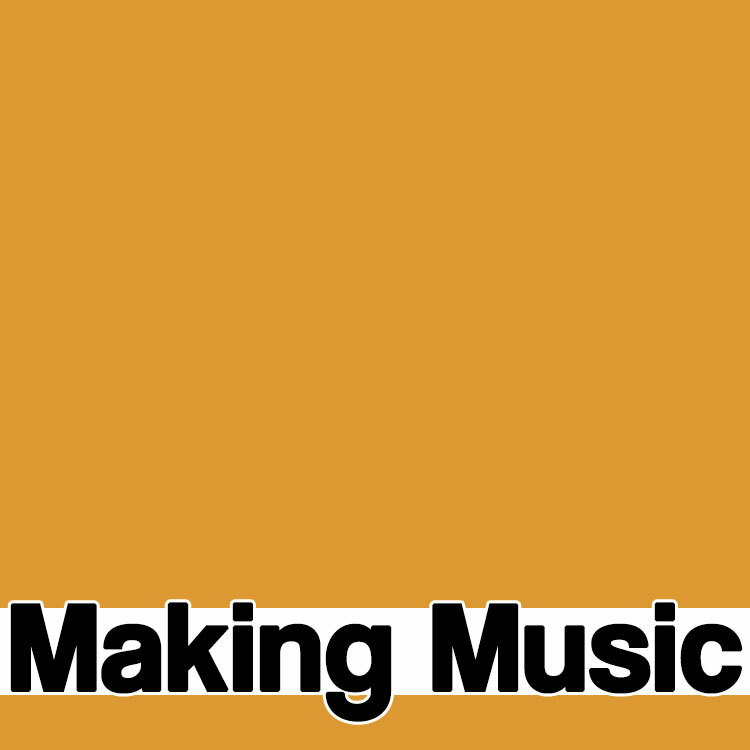 The Volume and Dynamics are sliders which helpfully show a percentage setting when you move them with the mouse although not with a MIDI Controller. It might also be useful if the figure remained at the top or bottom of the display so you could see the value at a glance. The Knob is a large, assignable rotary control. Unlike rotary controls in most software which move from hard left to hard right as you move the mouse upwards, with this you grab the dot and move it around the circle in a circular fashion. It might sound a little complex but it’s far more intuitive than up for clockwise and down for anticlockwise. The Assignments include Reverb, Tightness, Release and Vibrato although not all are applicable to all articulations. Tightness, for example, which appears in Spitfire’s Alternative Solo Strings is used with the short articulations. Increasing it cuts into the note making the attack or ‘sound’ portion of the note start earlier at the expense of a little realism. When loading a suitable Preset setting it to 50% is a good starting point. The Release is only used with long articulations. All these controls can be assigned MIDI Controllers. Clicking on the Preset name near the top of the window drops down the Preset Selector. As you scroll through the list, the instruments on offer appear on the left. 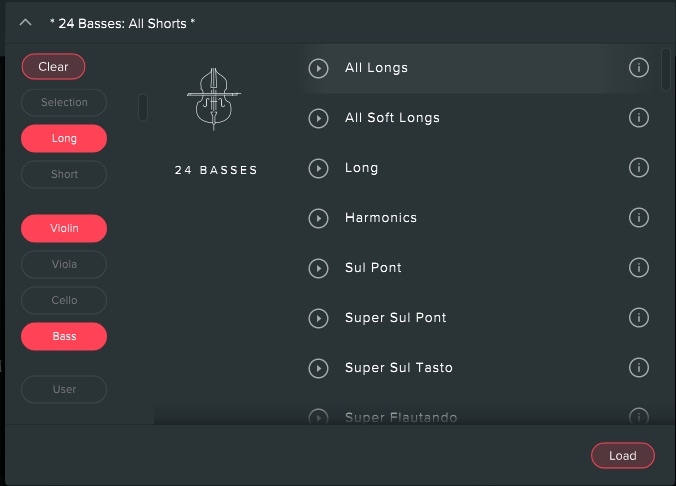 You can show only certain instruments and articulations by selecting filters. Clicking a Play button next to a Preset plays a short sample and is a quick way to find out what it’s roughly like before loading it. Usefully, you can also save your own Presets. The lower half of the interface can show one of three displays – the Technique Selector, Mixer and FX. What most people probably call articulations and which are called that in Spitfire’s Kontakt libraries are here called Techniques. And what a lot there are, although what you see in the interface depends on the instrument currently selected. Since we have the space, it’s worth listing them with just a few words where necessary. Long. Recorded with various degrees of vibrato. The Mod Wheel can crossfade between very soft and very loud dynamics. Con Sord. Con Sordino or ‘with the mute’ which has a dampening effect on the strings. Soft Con Sord. Contains only the very quietest dynamic layer. Harmonics. Holding lightly on the string a perfect 4th up from the fingered note creates an ‘artificial harmonic’ two octaves up from the note being fingered. Sul Pont. Sul Ponticello or ‘on the bridge’ which produces an edgy sound. Super Sul Pont. Played as close to the bridge as possible. Sul Tasto. With the bow over the fingerboard. This produces a thinner more delicate tone. Super Flautando. Often played near the fingerboard to produce a flute-like or glassy sound. Tremolo. Rapid bow movements on a single note. Tremolo CS. Tremolo Con Sordino or Tremolo with the mute attached. Tremolo Harmonic Waves. Combines Tremolo and Harmonics. Tremolo CS Sul Pont. You can probably guess this one – Tremolo with mute and played close to the bridge. Tremolo CS Pont Waves. And this one – Tremolo, Con Sordino, Sul Pont and Waves. Col Legno Tratto. ‘Drawn With The Wood’. The bow is turned over to play with the wood. Short. A very tight sound that can be used as a staccatissimo or a sequence of fast short notes. Pizzicato. Plucking the string with the finger. Strummed Pizzicato. A gentle sideways pizzicato rather than the more traditional vertical pluck. Pizzicato Bartok. A hard pluck so the string snaps back to the fingerboard producing a percussive sound. Col Legno. ‘Col Legno Battuto’ or ‘hit with the wood’, turning the bow over and striking the string with the wood. Legato. This captures the sound of one note moving to another. You need to play monophonically and hold down one note while you move to the next. FX. 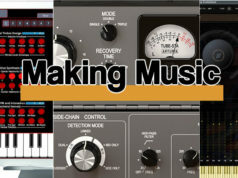 A collection of various FX, from slides to ‘chattering’ and ‘cluster’ sounds. If you skipped the list, please at least have a skim through. There are several take-aways from it. One is that it includes articulations and playing styles that you may not find in other libraries although many do appear in other Spitfire libraries. Another is that some Techniques would naturally produce a less-than-musical sound. However, when played by so many instruments, the result is a blurring of the tones so they do, in fact, sound musical. This is evident in the Col Legno, for example, which produces a smoother sound than you might expect and quite ambient. Using so many instruments can change the perception of the traditional sound which is one of Zimmer’s reasons for using so many musicians. Another point to note is that many of the Techniques such as the Soft Con Sord are played very softly which, again, produces a different tone. There’s more to be said about this later. Not all Techniques are used with all instruments. What is strange is that not all the same Techniques are used even between the same instruments. 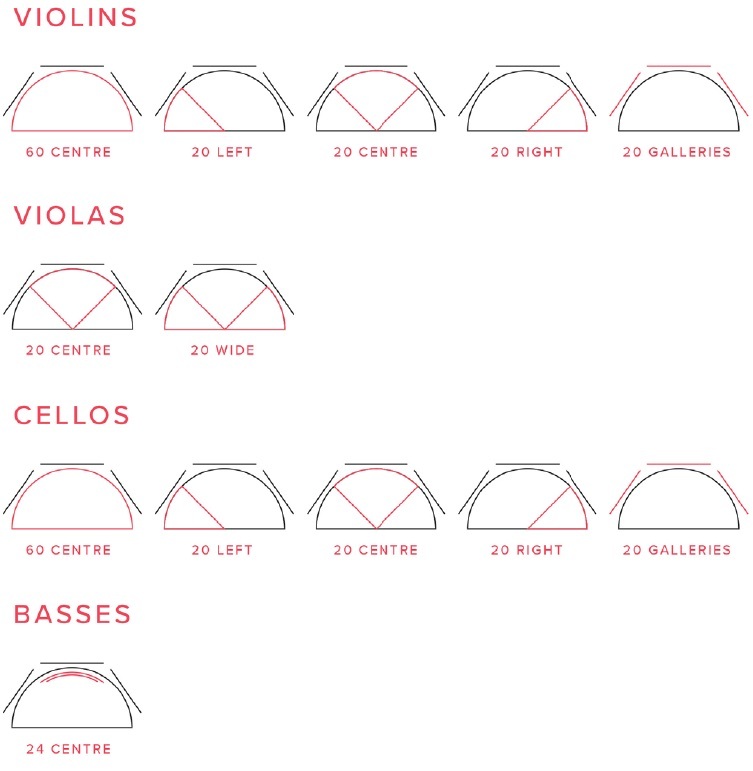 For example the 20 Cellos Right has 16 Techniques, the 20 Cellos Left has 13, and the 20 Cellos Centre only has 6. The 60 Cellos has 11. This is not necessarily a problem unless you want to use the same Technique across different sections – which would be really neat – although you might wonder about the decision behind it. In this section are also controls to move the keyswitches, adjust the round robins and other related function which will be familiar to users of other Spitfire libraries. One of the highlights of this library is the Mixer which features up to 26 Mics which can change the ambience of the instruments. The default tends to be the Tree Mic which produces a good ‘all round’ sound. You can increase the ‘bite’ or attack by adding in the Close Mic and increase the ambience by adding the Ambient or Gallery Mic. There are actually four Close Mics and several Spot Mics. The manual doesn’t give details of the Mics but a little Info box pops up bottom left when you run the mouse over a Mic – or any control – telling you what it is. Instead of juggling all 26 Mics you can opt for a simple view which lets you specify how Close or Far away the sound is. This actually adjusts the Close, Tree and Ambient signals. There’s also a super useful stereo width adjuster and pan control here. 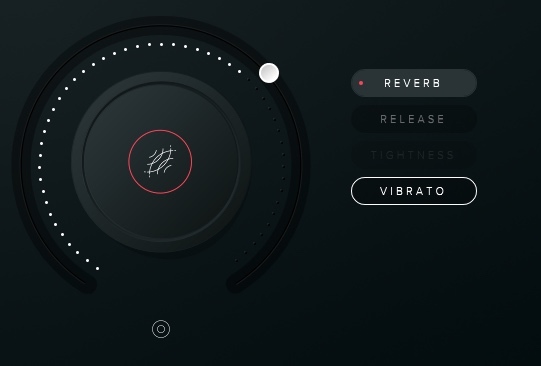 The final section is FX where you can adjust the Reverb, Release, Tightness and Vibrato settings. One thing that becomes apartment when playing through the Presets is how unevenly balanced some of the articulations are to the point where some are almost inaudible. Using the ’60 Cellos: All In One’ as an example, at a reasonable volume for the Legato, Long and Short Techniques, the Long Soft CS, Long Super Sul Pont, Long Super Flautando, Col Legno Tratto and Tremolo CS Pont Waves can barely be heard. The quiet playing does produce a wonderful tone but to be useful, the volume needs to be raised by adding more Mics, which increases CPU usage, or by increasing the output volume. Whether or not this is seen as a problem to look at in a future update remains to be seen. As a plugin, Hans Zimmer Strings loads into Vienna Ensemble Pro which many composers use. 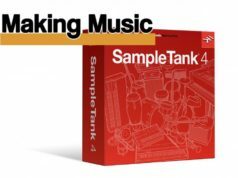 It holds sample libraries outside their DAW for faster project switching and efficiency. 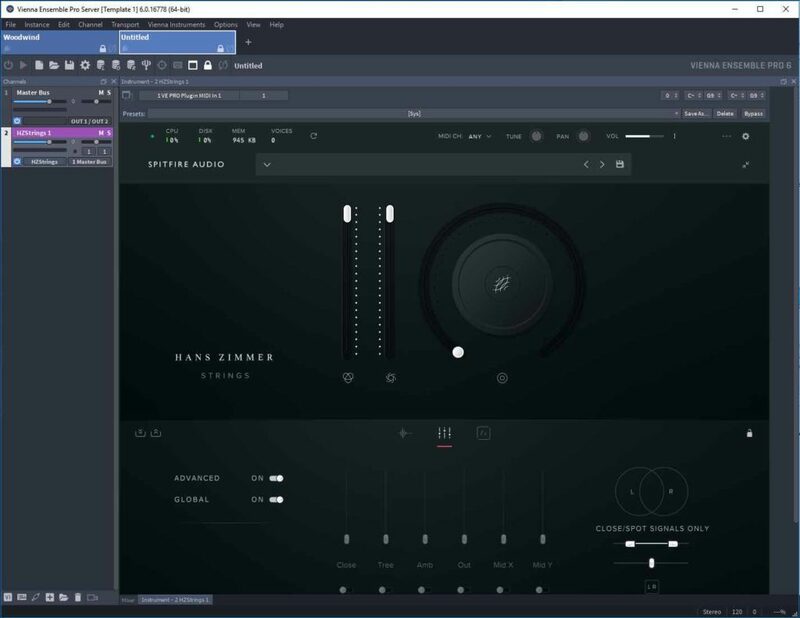 It’s interesting to see Spitfire step away from Kontakt as a host and use the plugin format, although the company is keen to stress that it will still be making Kontakt libraries. However, this has caused a few hiccups and Spitfire released an update during the preparation of this review and more updates are in the pipeline. One example is a problem with the Legatos, some of which have been remedied but others are still to be addressed. Also, the Legatos don’t have any round robins which can make repetitive lines less realistic although we’ll have to see if this is something that can or will be fixed. Spitfire says the interface uses simplified controls tailored specifically to orchestral work although it is similar to Kontakt in many ways. A new interface is an opportunity to create new controls and functionality but perhaps Spitfire mainly wanted a custom engine that doesn’t rely on a third party. One issue with the interface, and this will probably not affect many users, is the colour palette. Dark grey text on a black background may appear cool but it offers poor contrast which can make it difficult to see in certain lighting conditions unless you have a bright monitor and good eyesight. Not everyone has 20/20 vision and some users will seriously struggle with the contrast – or lack of it. 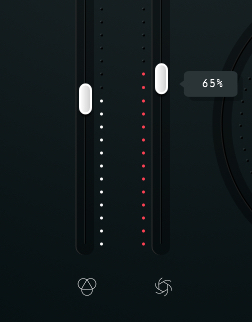 Some instruments let you change the colour scheme for just such cases so a plea for Spitfire/UsTwo (a ‘design and user-experience’ agency who designed the GUI) to add this option in an update – or lighten the text! The GUI is resizable which is great and it has massive screen real estate so it’s slightly frustrating that you have to scroll around to access Techniques and Mic positions when they would comfortably fit into one screen (or two max), especially when Spitfire’s Kontakt GUIs pack a lot of info into a very small area. For a newly-designed interface, it could have been more user-friendly. Think ‘Hans Zimmer Strings’ and most people with think of the big scores like Dark Knight and Pirates of the Caribbean. There are no specific Spiccato or Staccato articulations which are often the Go To artics for Zimmerian bombastic lines and ostinato lines but the Short Techniques are powerful and will handle many such runs perfectly well. You can sharpen them with the Tightness control and add some bite with the Close Mic although they might not cut the mustard if your ostinati lines are flying off the page. But many people forget that Zimmer is not just about ostinati, and his scores also feature underscore strings, tension builders and sounds that you may not get out of the box. This is where the quieter Techniques and large number of players come in. Given all this, you can build up your own unique string sections which is surely one purpose of the library. There are copious demos on the Spitfire website so do check them out to unearth some of the possibilities. This library will divide opinion on many levels, probably more from expectation than content, although many implementation concerns still need to be addressed or accepted by the user. If you look upon it as ‘a’ string library rather than one which is going to give you access to Hans Zimmer’s ‘secret’ string section, you will not go far wrong. It won’t have escaped your notice that this library is not inexpensive. That may be partly down to the glitz of the Zimmer name and/or to the cost of getting so many musicians together. Whatever, it will be a very considered purchase for many, and if you already have some Spitfire string libraries you may not feel the need to add another one. If you do buy it, however, taking on board all that’s been said so far, you will not be disappointed. In short, this is a wonderful-sounding string library capable of a wide range of tones and articulations and with fantastic breadth. You do have to delve into the options and Mics to get the most from it and it’s not without its shortcomings. Like every single library out there, it doesn’t do everything but what it does do it does impressively well.